Authorities 'failed' over Syria girls. 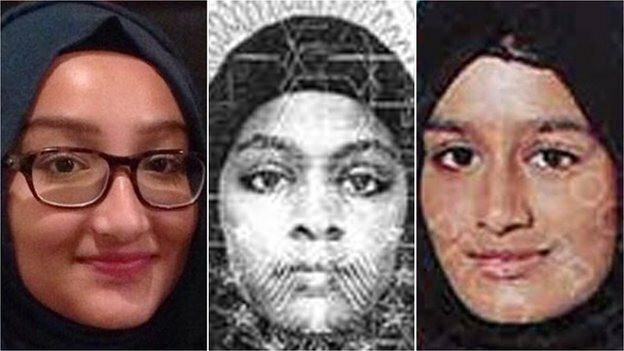 he family of a Glasgow woman suspected of encouraging three London girls to join Islamic State (IS) say officials "failed" to stop them leaving the UK. Aqsa Mahmood, 20, who went to Syria to be a "jihadi bride" in 2013, reportedly had online contact with one of the girls who left London last week. It is feared that Kadiza Sultana, 16, and Shamima Begum and Amira Abase, 15, may try to join extremists in Syria. Scotland Yard said it would not discuss matters of surveillance and security. In a statement, Ms Mahmood's family said it was "full of horror and anger" that she "may have had a role to play" in recruiting the girls for IS. "However, the security services have serious questions to answer," the family added. "Aqsa's social media has been monitored since she disappeared over a year ago, yet despite alleged contact between the girls and Aqsa, they failed to stop them from leaving the UK to Turkey, a staging post for Syria." The statement said despite UK government "rhetoric" about IS, authorities had not taken "basic steps to stop children leaving" to join the militants. Addressing Ms Mahmood, who moved from Glasgow to Syria to marry an IS fighter, the family added: "You are a disgrace to your family and the people of Scotland, your actions are a perverted and evil distortion of Islam." Their lawyer Aamer Anwar told BBC Breakfast that they wanted to know how the girls could have been allowed to travel to Turkey alone. He added: "They are deeply distressed and angry. They are thinking: 'How many other families is this happening to?'." Kadiza, Shamima and Amira, who all attended Bethnal Green Academy in east London, flew from Gatwick to Turkey after telling their parents they were going out for the day. Police said they had been interviewed after another girl from their school went to Syria in December, but nothing had indicated they were at risk. BBC home affairs correspondent Daniel Sandford says Ms Mahmood uses a Twitter account to encourage British women to join her in Syria, and that last Sunday Shamima sent her a message via Twitter. He said it was not clear whether the London girls - all "star GCSE pupils" - had yet crossed from Turkey into Syria. The schoolgirls' families have all made public pleas for them to return home. Shamima's family said: "Syria is a dangerous place and we don't want you to go there. Get in touch with the police and they will help to bring you home. "We understand that you have strong feelings and want to help those you believe are suffering in Syria. "You can help from home, you don't have to put yourself in danger. Please don't cross the border." Kadiza's family said: "In your absence, we, as a family, are feeling completely distressed and cannot make sense of why you left home. "Due to the speculation that you may be travelling towards Syria, we are extremely worried about your safety." And Amira's family said: "You are strong, smart, beautiful and we are hoping you will make the right decision. "We miss you more that you can imagine." Prime Minister David Cameron said the situation was "deeply concerning" and UK authorities would do "everything we can to help these girls".